The menu Flash — Configure Flash Tools opens a dialog to set Flash download configurations. Refer to Utilities for a description of the fields. 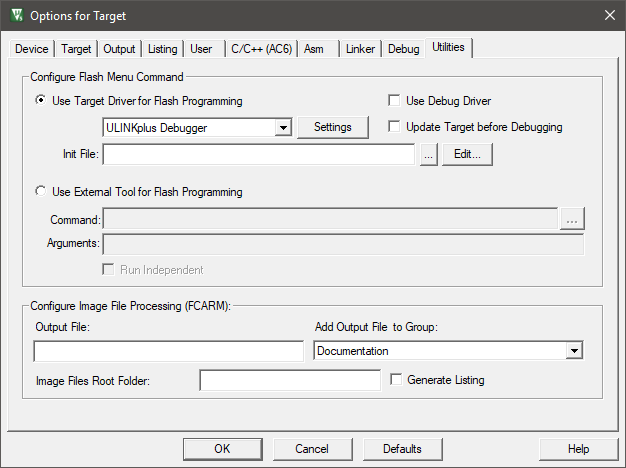 Enable Use Debug Driver when using the Debugger adapter as a debug and Flash programming unit. Enable Update Target before Debugging to download the application to Flash whenever a new debugging session is started. The download is processed only when the binary was updated since the last Flash programming step (this feature is to avoid unnecessary reprogramming sequences). When switching between µVision instances, use the explicit "Load" button to ensure that the image of the current target is downloaded to Flash. When disabled and the application was not downloaded manually to Flash, you may enable the option Options for Target - Debug - Settings - Debug - Verify Code Download to ensure program correlation between the target system and the µVision debugger. Enter a Pre-Download Script into the field Init File to specify commands which prepare the device for Flash programming. For example, to configure the bus. Enable Use External Tool for Flash Programming to enter options for third-party command-line based utilities that are not in the list of target drivers. You can use Key Sequences. Enter options to Configure Image File Processing (FCARM) by invoking FCARM during the build process. This converts image files into C-source code. Refer to Using FCARM with µVision.